British archives have revealed that during World War One, a third of sailors were under the legal fighting age of 18, and many were just 14 years old. More than 380,000 Royal Navy records have been released, showing that around a third of all men who enlisted during World War One were underage. The records are the Registers of Seaman’s Services. They document every Royal Navy sailor’s name, date of birth, location of birth, ship they sailed with and service number, as well as additional comments. The records from 1900 to 1928 have been digitally uploaded for the first time from the National Archives, and are now available on Ancestry.com, a family tree website. It appears that many of the sailors were young boys, who hurried to join the Navy when the war broke out in 1914. Numbers run into more than 100,000, and for many it was their first time away from home. For example, Claude Choules, from Worcestershire, joined the Royal Navy at 16 to serve on the British battleship Revenge. 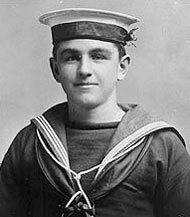 After World War One he went to live in Australia, and joined the Royal Australian Navy. Claude even went on to fight in World War Two. Claude lived until he was 110 and passed away in Australia in 2011. He was the last surviving veteran of World War One. Hundreds of thousands of underage boys also joined the British Army and were sent straight to the front line to fight in the trenches, The Telegraph reports. Researchers say that it was a sign of the times, when in the early 1900s few people had birth certificates and so could easily lie about their age. Further, with the outbreak of World War One, military recruitment officers were on commission for every new recruit they signed up for the Army or Navy, so many would overlook the age difference. Looking back, historians view the mass recruitment of underage boys as a large tragedy of World War One. Many didn’t have the experience or training that older servicemen had, and therefore stood less chance of survival. Researchers have estimated from looking at the documentation that the underage boys were also more likely to give up their lives than their older colleagues.